This was our third year of traveling to Anaheim for Expo West and each time it has been inspiring in its own way. The energy of 86,000 people from 136 countries gathered in one place to partake in the world’s largest natural, organic and healthy products event is contagious. Aside from sharing the enthusiasm (which is critical! ), the trends that emerged this year are important for many reasons – and will likely shape much of the dialogue and direction of the CPG space in months to come. This year, the education sessions really stood out in both content quality and relevance. One of the most informative was hosted by NEXT and shared findings from recent consumer research. The research captured a broad spectrum of buyers that identify with different attitudes and behaviors and established five consumer segments. Each of these segments are unique in many ways but what really shaped the dialogue around the presentation was a key finding: that the segments agree on what the most important issues are in the industry: Waste Reduction, Sourcing Responsibly, and Regenerative Agriculture. Global / Environmental Responsibility. 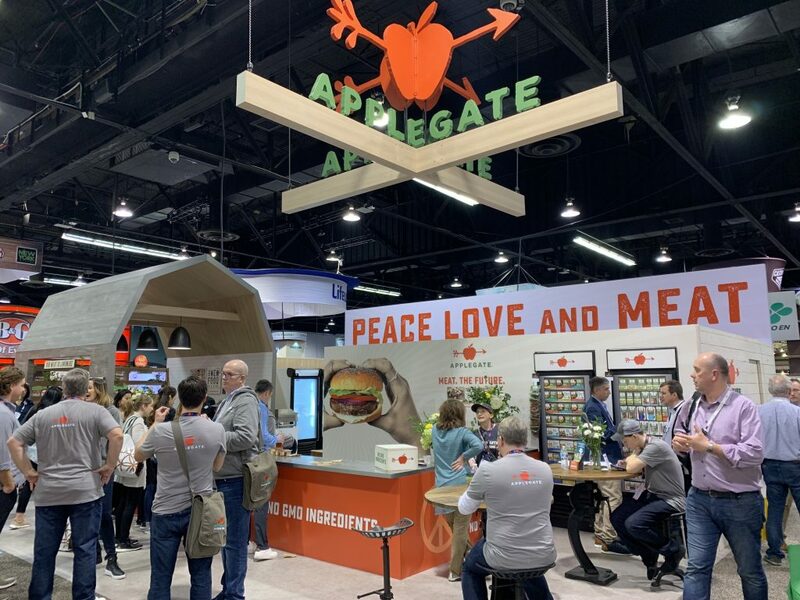 Waste Reduction, Sourcing Responsibly and Regenerative Agriculture were prominent trends at Expo West this year, in a broader umbrella trend of “Global / Environment Responsibility”. Definitely the most dialogue and energy from “the crowd”, these themes came to life through the show in a number of interesting ways. Generally, products and brands are talking about much more than the end product. More of the messaging is around the larger footprint – partners, sourcing, labor practices and sustainability efforts. 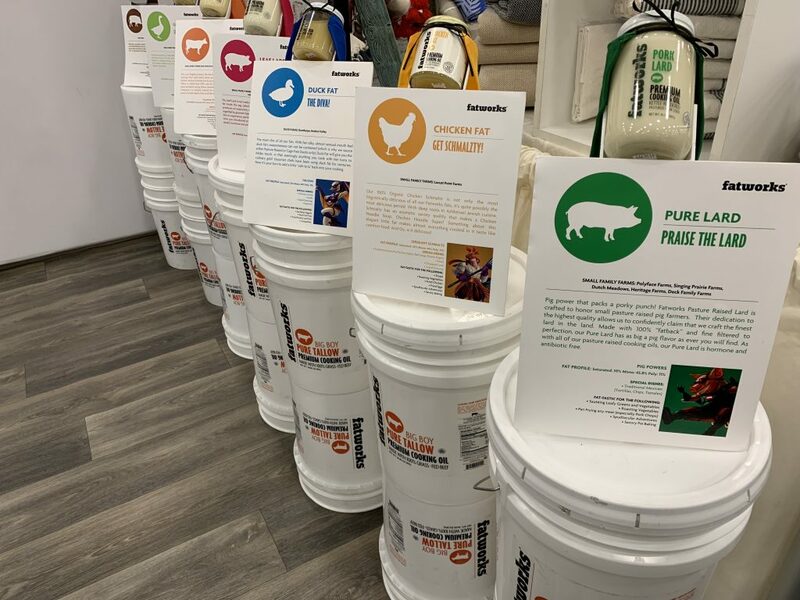 Applegate Farms was acknowledged in the “Regenerative Agriculture Innovation: Humane Animal Treatment, Soil Health” category for its ecological practices, specifically for their Organic Chicken Strips. The chicken is verified for animal welfare through certified programs that ensure they meet strict requirements for the treatment of animals. CBD. 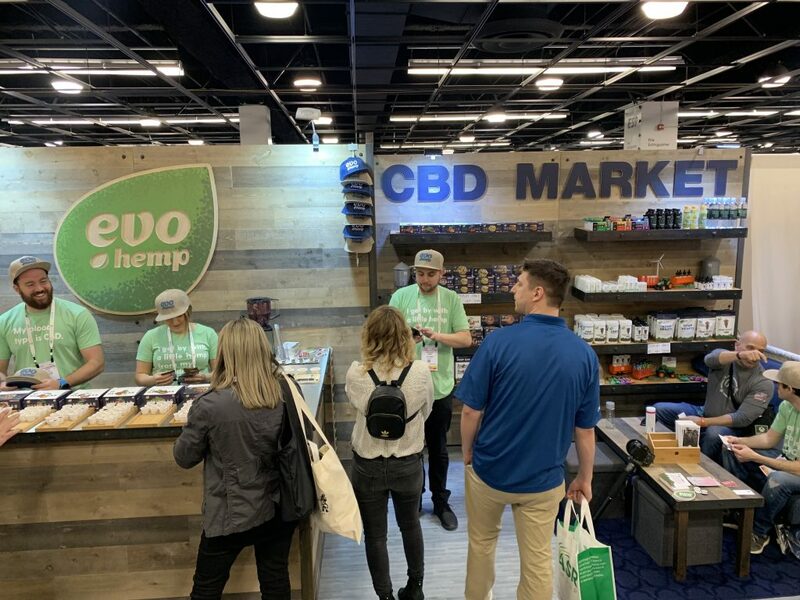 If you’ve read any of the post-show recaps, you already know how massive a presence CBD had at Expo West this year. I won’t pretend to be an expert on this topic – in fact, as someone who attends a number of industry events that include education sessions dedicated to this very topic –I still find it pretty ambiguous. Aside from the regulatory complexities, the broad range of products and claims leave a lot to be desired when it comes to minimizing consumer confusion. What is clear is that there is a huge appetite to develop new and innovative products in this space. The sheer quantity of products with this messaging compared to a year ago proves that – along with the wide variety of formats in both food and beverage. In speaking with a number of founders at different booths, there is a high level of energy to understand, educate and adjust – which will likely be a key factor of success in upcoming months and years. Fats + Fads. As NEXT dubbed it, “sugar villainized” was a key theme at Expo West this year. Alternatively, products flaunted the prominence of fat. In fact, many incorporated it in the name and messaging, and often embraced the animal-base that it was derived from. Whether a fad or here to stay, the prominence of lifestyle diets has grown over the past year – Paleo and Keto, in particular. The incidence of the use of “Protein Claim” on products exhibited this year is now in the top 10 at the show. This is inline with what I saw when it came to messaging that spoke directly to being Paleo- and Keto-friendly. It will be interesting to watch how this evolves over time alongside Vegan, Kosher, Clean and Whole-30. Expo West continues to grow each year – not only in the number of exhibitors and attendees but also in content and conversation. Based on what we saw this year, there is going to be a continued focus in the natural food space on how products fit into a more integrated lifestyle that incorporates values, functional ingredients and the ongoing pursuit of healthy living. “Connecting with the Changing Consumer” NEXT, Data & Insights division of New Hope Network. Expo West: 2019. March 2019. It was a curious scenario: the company had incorporated digital advertising into its marketing program, sales were up and the return on ad spend had increased. But brand affinity was in serious decline (brand affinity being a metric that lets market researchers make predictions about how a consumer will behave).1 In fact, a relevancy study showed their flagship brand was in the bottom third of 400 measured brands. Speaking at the Association of National Advertisers’ (ANA) 2017 Masters of Marketing Conference, Clorox CMO Eric Reynolds recalls finding himself in a situation many corporate marketing teams are currently facing. By focusing almost entirely on short-term objectives, Reynolds says their marketing and advertising became very rational and very functional. It’s an all-too-common story. In today’s ROI-centric business environment, the value of brand building has been forgotten. 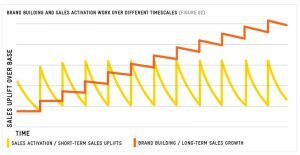 In the last few years, there has been a fairly significant change in effect from long-term to short-term brand activation. Not long ago, long-term brand building accounted for 69% of brand relevancy. But according to recent studies from Les Binet and Peter Field, that impact has been reduced to 47%, as short-term activations have risen from a 31% to a 53% majority share. And that’s problematic. Because brand building does more than shore up brand awareness, brand preference and even, in some cases, increase sales. Brand building is critical because strong brands command a higher price and ultimately lead to long-term sales growth. Brand building is the most important strategic marketing priority to ensure long-term profitability. We understand that in today’s business environment, demonstrating ROI on marketing and advertising investments is more important than ever. While brand building efforts may not necessarily increase revenue in the short-term, doing it effectively allows companies to charge higher prices over the long-term. And increasing profits, not just sales, is the ultimate return-on-investment. Standard ROI calculations are great for short-term marketing and advertising initiatives. But measuring and assessing the impact of long-term brand building means using an alternative guide to performance. This also means brands must prioritize resources to measure, test and evaluate effectiveness of brand building campaigns over the long term. Devault, Gigi. “Learn Simple Ways to Boost Brand Affinity.” 2017. Kearon, John. “Marketing From the Heart for Growth.” WARC. 2017. Can You Make the Logo…Smaller? Speaking at the 2017 Consumer Analyst Group of New York, Tyson Foods President and CEO Tom Hayes talked about a new vision for the company and unveiled a dramatically new corporate logo. A stark departure from the thick white font atop a red and gold seal, the sleek “T” stands out for its simplicity and–dare I say–boringness compared to the sea of food and beverage logos out there. Such a digression away from the original logo indicates much more than a corporate culture shift. In fact, Tyson has embraced what designers call responsive branding. In short, the spaces our logos occupy are getting smaller and more varied thanks to an increase in technology and social platforms. Before, as the curators of our brand communications, we could be confident in our assumptions about what our brand elements would look like when appearing on printed materials, websites, billboards, etc. In the new digital ecosystem, logos get squeezed to anything from a 40 x 40 social media profile image to a 16 x 16 pixel icon on the tab of a browser window. With the proliferation of sharing on an ever growing number of platforms and devices there is no telling where or how your brand presence will display online. The result: detailed and/or complex logo designs become unrecognizable when scaled down. Both retail and foodservice companies need to proactively begin the responsive logo design process for existing brands and corporate logos. 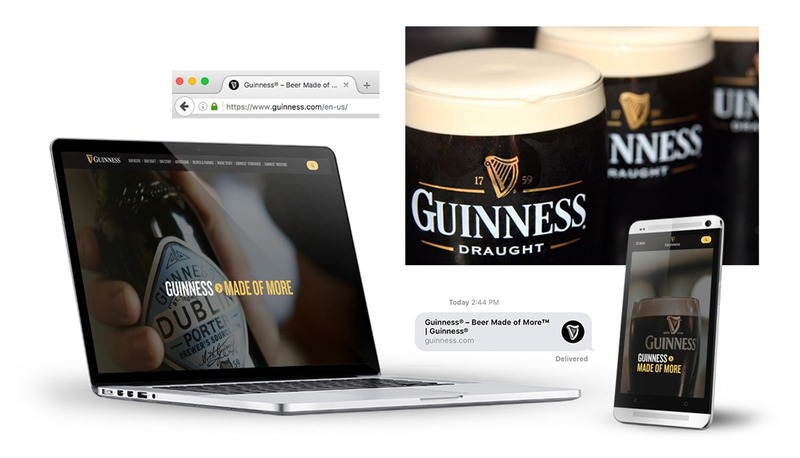 As mobile, e-commerce and smart technology advances affect how we interact with food and beverage brands, responsive logos are needed to ensure consistent, continued brand recognition among customers. Investing in responsive logos will make it easier to adjust to shrinking screens and heightened UX demands in the future. Consider all the ways your audience will interact with your logo, including digital environments and device usage. Responsive logo design means thinking of your logo not just as a graphic, but as a system of modular components that allows you the flexibility to iterate several versions of your logo, each successively distilled until you reach the most basic yet recognizable element. This will ensure consistency across all mediums, technology platforms and devices. If you want a glimpse of the 2026 consumer, look up Amanda Steele. She’s a typical California high-school senior; a self-professed coffee lover who listens to Drake and says economics is her favorite class. But in 2010, Steele began posting makeup and beauty tutorials on YouTube from her bedroom as a way to connect with fellow teens. Today, her YouTube channel MakeupbyMandy24 has 3 million subscribers, and has garnered Steele her own branded makeup collection, a modeling contract and a steady stream of red carpet appearances. While A.T. Kearney highlights several reasons for the shift from affluence to influence, the widening gap of income inequality is perhaps most instrumental. In other words, influence is everything. We as food marketers must begin shifting our approach to brand development and brand building in preparation for the Influence Model for consumption. Dave Dahl was a convicted felon who, upon serving a 15-year prison sentence, was given a second chance to rejoin his family’s bakery business. Dave worked tirelessly to create his namesake bread and, for every loaf sold, now donates a portion of the profits to the Second Chance Project, an organization that gives the 1 in 4 Americans with criminal backgrounds a second chance at meaningful employment. Traditional/Affluence-Model consumers look to food and beverage brands for ideas on social media they can easily replicate at home. Influence-Model consumers already have good ideas, but lack the tools or skills to make them a reality. 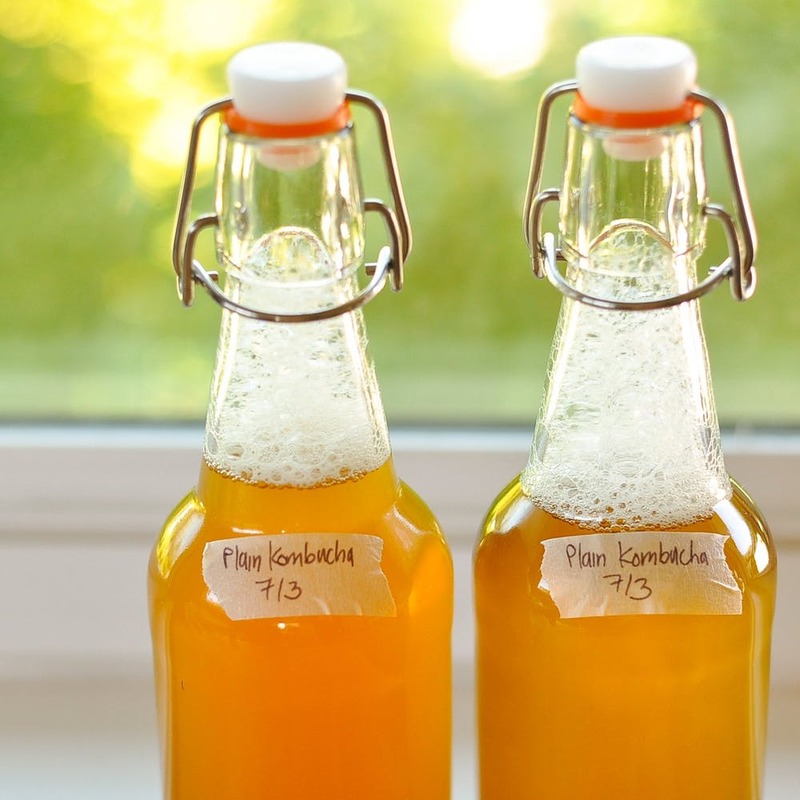 Take a cue from The Kitchn, which has an amazing arsenal of trendy how-to’s, like this article on making your own signature kombucha. 1 “How Wealth Inequality Has Changed in the U.S. Since the Great Recession, by Race, Ethnicity and Income.” Pew Research Center. 1 November 2017. 2 “America’s Next Commercial Revolution: Influence vs. Affluence.” A.T. Kearney, Inc. 2017. 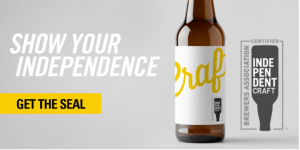 The battle between Big Food and small food was no more apparent than last month when the Brewers Association (BA) unveiled its Verified Independent Craft Brew seal. The association—whose mission is to promote and protect America’s small and independent craft brewers—makes the seal free to all members. Over the last few years, we’ve seen Big Food purchase smaller brands for a variety of reasons, yet the customer response is increasingly negative. They threaten boycotts, rant on social media and accuse independent owners of selling out. What’s behind the vitriol? *35% of U.S. consumers distrust big brands. *60% of U.S. consumers distrust corporate America. It all boils down to customers believing that Big Food will change—or destroy—what they know and love about the brand. Big Food should proactively prioritize building—or rebuilding—customer trust by focusing on the interpersonal customer relationship. Big Food has done remarkably well in developing beloved brands that are high in quality, safe for families and delicious. But in a world where those deliverables are considered table stakes, Big Food must also work to strengthen those personal connections customers have with the brand and the company behind it. To get personal with customers, Big Food needs to be more personable. Speak with an authentic human voice. Communicate like a real person—remove the marketing fluff and the corporate talking points. We must say what we mean rather than forcing customers to interpret our message. Case in point: In the days following a forcible removal of a passenger from a United Airlines flight in April 2017, the company’s CEO Oscar Munoz learned just how damaging corporate-speak can be in the midst of a scandal. On April 10, Munoz released a statement that was regarded as callous by customers. The statement caused a firestorm on social media and United Airlines’ stocks began tanking as news of the incident and the company’s response went viral. Less than a day later, Munoz issued a mea culpa to the press. Highlight your people. Customers crave a personal connection, so help them get to know you on a deeper level. The Johnsonville Sausage campaign from 2016 is a great example; the ads were inspired by—and featured—real employees. Keep Small-Brand Acquisitions Autonomous. The frequency of mergers and acquisitions within the food and beverage space is likely to continue for Big Food to realize continued growth. But to ensure those small-brand customers stay with you, Big Food must encourage any acquired company to stay true to its roots. Stay tuned for our third and final installment of “Winning with Big Food” in September. *Source: “Untruth and Consequences.” Iconosphere 2017. Iconoculture Consumer Insights. ‘How can ‘Big Food’ win?’ was a question on everyone’s mind at this year’s Iconosphere conference in Las Vegas. 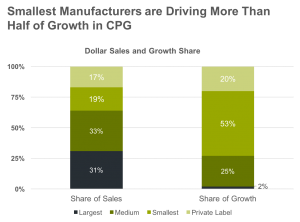 As one of the industry’s leading consumer insights conferences, hosted by Gartner (formerly CEB), food & beverage strategists reiterated arguably the biggest challenge ‘Big Food’ faces in today’s marketplace: small and medium manufacturers are driving half the growth in the CPG channel. Even though this data only represents retail data, we can’t ignore that changing customer demands in one channel aren’t influencing product decisions across foodservice, or even food at retail. Most analysts agree small and medium brands’ ability to respond to rapidly shifting trends, their focus on ‘clean’ ingredients, and increased availability have largely contributed to their success. These explanations highlight a common theme: ‘Small Food’ is perceived, by customers, to be better than ‘Big Food.’ Whether it’s the impression they use better ingredients, follow a better process, or create better-for-you products, ‘Small Food’ is increasingly perceived as a better choice. ‘Big Food’ needs to tell its story. Brands and manufacturers of all sizes are necessary and vital players in today’s dynamic food system. ‘Big Food’ plays a significant role in bringing food to our kitchen tables, favorite dining spots and emerging spaces where millions seek sustenance on a daily basis. This isn’t a David vs. Goliath narrative; it’s about reminding customers the importance each party plays. Consistent supply. We’ve been with many of our customers since their beginning. We’re on the shelf, in the case, and in the kitchen when and where we’re needed without fail. Record of safety. Our size gives us the ability to ensure the safest possible food with investments in the latest technology and equipment available. Higher standards. Volume speaks loudly. We can dictate which farmers/co-ops we work with, demand more responsible care of our crops and animals, and ensure we get first choice on ingredients which, ultimately, means higher quality for our customers. Look for Winning with Big Food: Part 2 next month! Narratives in marketing are nothing new; we’ve been telling stories to customers since the invention of our trade. But the narratives that resonate with our target audience has shifted substantially over time. At their latest A.C.T. (Anthropology, Culture, Trends) Conference, “Telling the Story of Food,”, The Hartman Group asserted that brand-focused narratives are quickly being replaced by product-focused narratives. Source: “Telling the Story of Food.” The Hartman Group. April 2017. 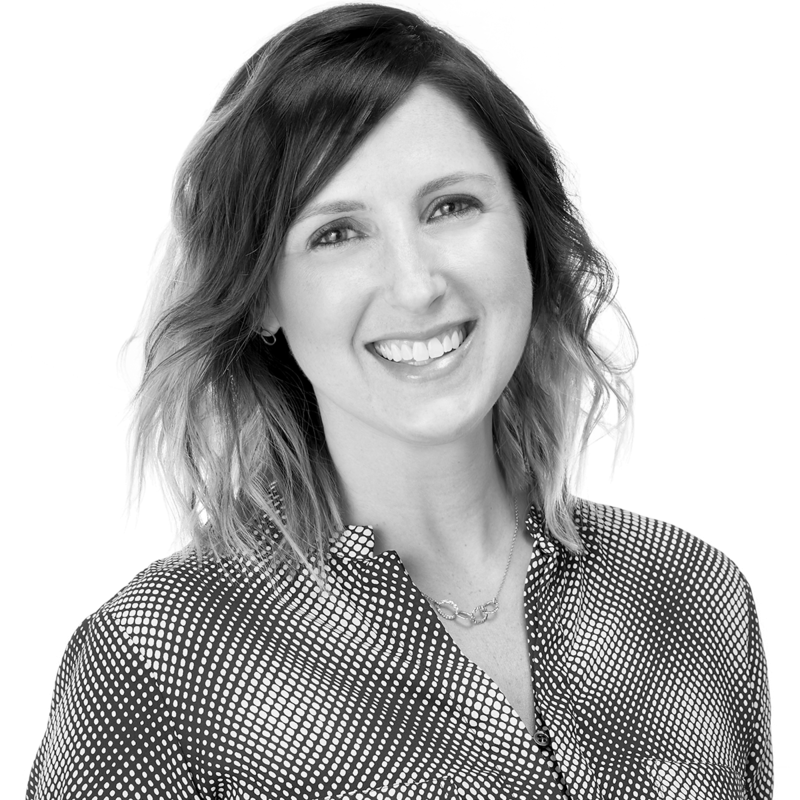 Based on their research, The Hartman Group explains that over time, our values have evolved from ‘practical and rational’ to ‘contemporary and experiential,’ which have resulted in product narratives to gain traction. Product narratives present a unique storytelling opportunity for marketers. ‘Old’ values and ‘brand narratives’ aren’t obsolete; affordability, consistency and convenience are certainly still important. But in today’s marketplace, these attributes are simply the cost of entry. As our industry continues to change and our target audiences’ demands evolve more rapidly, ‘product narratives’ give us, as marketers, a unique tool to stay fresh and pertinent with tomorrow’s customer. Ultimately, our goal with any new product initiative or legacy-brand refresh is singular: relevancy with our audience. Choosing the appropriate narrative – or combination of the two – will depend on your business objectives, target audience and go-to-market strategy. Regardless of approach, we must successfully address the customer’s most important question: what’s in it for me?